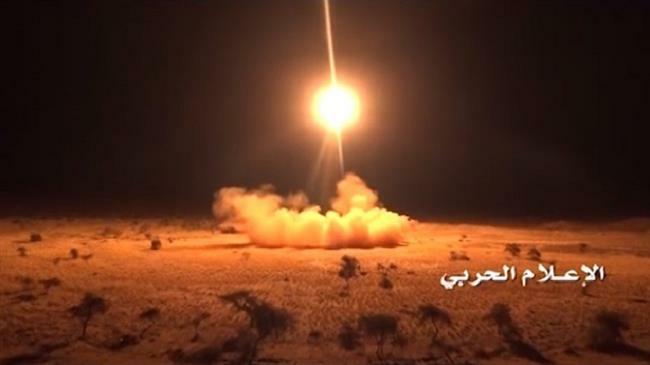 Najran(ANN)-Yemeni army troops, backed by allied fighters from Popular Committees, have fired a domestically-manufactured ballistic missile at a military base in Saudi Arabia’s southern border region of Najran in retaliation for the Saudi regime’s military campaign against the war-ravaged country, Yemeni media report. Yemen’s Arabic-language al-Masirah television network cited an unnamed military official as saying that Nahouqa military base had been targeted with short-range Zelzal-2 (Earthquake-2) missile on Monday evening, adding that the projectile had hit the designated target with high precision. The report further said that gatherings of Saudi forces at the base and behind it were also targeted with multiple artillery shells, adding that the attack killed and wounded an unspecified number of Saudi troopers and mercenaries. A Saudi military vehicle was also destroyed in al-Sadis military base in the same region after Yemeni forces hit it with rockets, the report added. Meanwhile, in a separate attack on Yemen’s western coastline, the Yemeni army troops and fighters from Houthi Ansarullah movement managed to kill and wound a number of Saudi mercenaries after hitting their gatherings with artillery shells. According to al-Masirah, the attack also inflicted damage to military hardware and vehicles of the Saudi forces. Additionally on Monday, at least nine Saudi mercenaries were killed after their vehicle hit a mine planted by Yemeni fighters in al-Ajasher desert in Yemen’s northern province of Jawf, al-Masirah further reported, citing an unnamed military source. Al-Masirah also reported earlier in the day that Yemeni snipers had managed to kill at least eight Saudi mercenaries and wounded two others who were attempting to advance towards the gatherings of Yemeni forces in Asifera area in the southwestern province of Ta’izz. The Saudi aggression against Yemen was launched in March 2015 in support of Yemen’s former Riyadh-friendly government and against the country’s Houthi Ansarullah movement, which has been running state affairs in the absence of an effective administration.